I didnt realize how much I would be using this book when I picked it up. It is by far one of the most valuable PF books available. Get it to add all the right contexts to your partys equipment. I'm rather disappointed with Ultimate Equipment overall. It reminds me an awful lot of the 3.5 Magic Item Compendium, with insanely cheap items and an overabundance of swift actions. I find UE nearly useless for treasure generation since "common" Core items end up being so rare, and 80% of what else it generates are broken (too powerful), over-exotically flavored, or too niche. The Treasure Tables themselves, while useful for certain situations, seem turn every NPC into a Christmas Tree of items, half of which I would have to look up to even know what they do. This is a great book for finding equipment when cashing out your loot in the game. jeeezzz Again? Paizians crew, be professionals please!! something annoyin is the fact that always paizians sell a book there will [and it WILL] be a lot of issues. how many flaws we gonna see until paizo learn how to sail a book without huge errors? Paizians, p. 370 Table 7-13, tell me the weapons from 66-84 please!! Excellent, with a few flaws. After the CRB this is now the most referenced book at my gaming table. This large and gorgeous book home home to pretty much every time you will need for your adventuring careers. The book is easy to read through and organized in a newer, much easier to read fashion. Each chapter is a different colour and represents a different thing, such as Arms and Armor or Wondrous Items. Speaking of Wondrous Items this chapter is probably my favorite, as it is organized into sub-sections based on what slot of the body the part takes up like Neck, Chest, Eyes ect. This makes searching for the item I want easy and quick to do. The art in the book is Paizos standard quality, sometimes amazing and sometimes leaves much to imagination. I would have preferred if their were pictures for everything, or at least all the not-so-common items, but that would probably be expecting too much. Some of the pictures don't accurately represent the item they are for, and some even go against the very description of the item. One thing I was slightly disappointed by was that all the extra gear from all the Adventure Paths didn't make it into here. I mean I have a nice big book with common items already, let move that junk out of the way for NEW stuff please. Now as for the name, is this book the Ultimate? I would say no, as like I mentioned there are lots of items in Pathfinder that didn't make it into here. However it is still extremely useful and gets used a LOT more than a handful of other books I own. I would say dfinately add this to your collection. I know everyone has known about this book for a while, but now it's formally announced! The cover image shows the final art, though the cover layout itself may potentially see minor revisions. First I noticed the price, seemed a little high, then the page. Hmmm. Will there be any rules in here or will it just be catalog? Lavishly illustrated with hundreds and hundreds of full-color illustrations and organized in a new easy-to-reference format that groups magic items by “slot,” Ultimate Equipment sorts all magical and mundane equipment released in the hardcover Pathfinder Roleplaying Game line to date with tons and tons of new items to create the most comprehensive treasure resource ever created for the Pathfinder RPG! As in Weapon Tricks, Feats, and Item Creatin rules, I think. Nice new cover, even though the characters' faces look a little off but I do love the detail on all the items. 400 pages wow can't wait. Not a lot (and maybe "no") new rules. It's more or less entirely item descriptions. So who has completed their time machine so I can hand over my money now? You can find it on page 262. So I owe you something along the line of 500,000 gold for a use of one of your daily charges and running it through a duplication process? It will be mine. Oh yes, it will be! Really, really hoping there are some options here for monks to enhance their unarmed strike(and only their unarmed strike) that fits their flavor. Like wrappings for the arms and legs, or body, something that infuses the entire body with their enhancements. Any word on new kinds of mechanics? I like the continuing trend of other iconics makes covers. 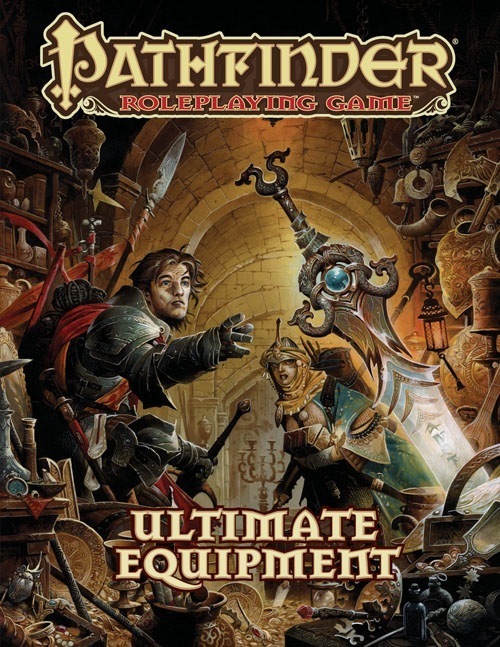 "...Ultimate Equipment sorts all magical and mundane equipment released in the hardcover Pathfinder Roleplaying Game line to date..."
How much duplication will there be between Adventurer's Armory, APG, and this? For that matter, are we going to see reprint of Core Rulebook items? Will wondrous items be a collection of random items like they are now, or will they get an organization something like Magic Item Compendium did? I'm really hoping that the new content includes more mechanics too, and not just lists of items. I can't wait to see all the new magic items, and maybe artifacts! Can't wait! Any idea how much of this will be legal for society play? It's part of the rulebook line, and is thus world-neutral. As Erik mentioned above... there's very few, and probably no new mechanics in this book. It's pretty much all items, all the time. Though I would not expect a lot, will there be any Gunslinger support in this? Guns? Weapon Special Abilities? From the design end, much effort was made to get plenty of lower-priced items in. That should help with new items appearing on PFS Chronicles. God I hope it's not formatted like the magic item compendium, that thing was a royal pain to find anything in, I trust in Paizo to improve. I'm kind of hoping it does repeat the core stuff, having everything in one book is just spectacular for us old guys who like the dead tree tables. Nice for noobies too. Hopefully the descriptions actually describe the weirder weapons and clear up their implementation. (Cough Rope Dart, ahem). Some art on things like Mere clubs, Aklys etc. There are enough weird weapons now to warrant it. My newer, less weapon savvy players could really use this type of assistance. The Urumi almost gave my brother in law an aneurism. I'm with Mikaze on the Monk enhancement for UA strikes. Monk substitution weapons would be cool for monks from non traditional backgrounds. It's the new alchemical items that have me excited. 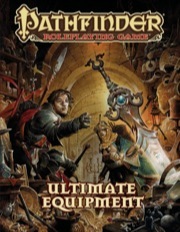 Prior to Paizo this was one of the most overlooked areas in equipment, high level pricy alchemicals could be so cool. Is there any chance we'll see a Treasure Table for random treasure generation? Possibly akin to the tables in the 3.5 srd (http://www.d20srd.org/srd/treasure.htm#usingTheTreasureTable) with some additional tables to include specific magic items/weapons or magical properties for items/weapons? It repeats the core rulebook stuff, but a lot of it has been rearranged by magic item "slot." We agonized over this, but eventually sided with making this book a more useful reference by including pretty much everything. What are the chances of item sets that grant bonuses based on the number of items from that set worn? this would be the perfect place to plug in a artificer type class. One thats not a vancian caster like in 3.5 but rather a non magical wand / gear junky that can bring out the absolute best in any item and craft any item. I believe there won't be anything but equipment in this book. No new base classes, no archetypes, no spells. ...maybe equipment trick feats, who knows. i know and i doubt there will be feats as well, dont get me wrong it looks like a awesome product and ill still be getting it but talk about missed opportunity with the artificer / feats. We agonized over this [including core in ultimate equipment], but eventually sided with making this book a more useful reference by including pretty much everything. I can get behind this decision: a catalogue without the basic stuff isn't a complete catalogue. I would have hated the "This is the ultimate equipment book! ...once you add its content to this, and this... oh, and this too". All in all I am glad to see this. It's a huge help not to have to pull out four differnt books every time I need to referance something. And I agree with others that some more art would be wonderful. I love the pictures in these books but like it was say there are times where items exist and me nor my players really know what we are looking at. I wonder, if there's going to be new alchemical stuff, will the alternate rules for alchemical items as additional material components for spells from Adventurer's Armory be coming back? New items, totally. Don't expect alternate rules systems about equipment, though. This is all pieces of equipment all the time, not discussions about them or tricks to use them. A 400 page book of alchemical, mundane, and magical items is fine by me. I just hope that we get some high level alchemical items. Been a problem with d20 for a decade. Now that there's a real alchemist base class with continuing support, it's needed more than ever. Alchemical items are NOT the same as items for alchemists. One of the main elements of alchemical items is that they're "small magic." They're not MEANT to be things for high level players to look forward to. Or even things for mid level characters to do the same for. They're meant to be relatively inexpensive but still useful tools for low level characters. Doesn't mean we can't and won't do magic items specifically geared toward alchemsts... but they'll be MAGIC items, not alchemical items. I totally appreciate the convenience factor of bringing together already-seen material from other Paizo products. But speaking as someone who already has all the other Paizo products I can't understate how much I hope that 'tons and tons of new items' translates into at least 25% of the book. But WHY? I mean, I get that the Alchemist has bombs, and elixirs and such, but one of the things I like about them is their mastery of the Craft: Alchemy skill. With the right preparation, they can effectively be Batman. Why does alchemy have to top out at about fifth level when magic items push them rudely out of the way? Where's the love for the Greater Tanglefoot bag that effects whole rooms? Core+APG magic items = 130 pages, so even with all the Golarion-sey items I think we're looking at least 200 pages of new content or so. Ah yes, the fabled bag of black tentacles.